Harvard University has been accused of “shamelessly” profiting from photos featuring 19th-century slaves, all while ignoring repeated requests to turn over the photos to the descendants of those pictured. As a result, a lawsuit was filed on Wednesday. 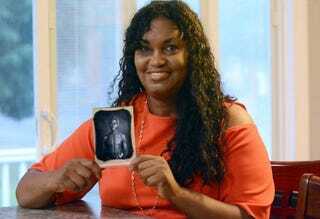 According to USA Today, the school is being sued by Norwich, CT., resident Tamara Lanier for “wrongful seizure, possession and expropriation” of images she claims depict two of her ancestors. In her suit, which lays out eight different legal claims, she is demanding that Harvard not only turn over the photos immediately, but acknowledge her ancestry and compensate her an unspecified sum for damages. The pictures, which were purposely malicious, were intended to promote the bogus theory of polygenism—in which white folks are somehow superior to the rest of us, despite their propensity to age at an accelerated rate due to their uncanny aversion to properly seasoned food. Even though Agassiz helped lay the groundwork for over 100 years of state-sanctioned segregation, discrimination and violence against African-Americans, Harvard continues to defend him as a great scientist of his time and continues to profit from the images while refusing to acknowledge the legitimacy of Ms. Lanier’s familial relationship.